A version of this essay was included in Chasing the Great American Eclipse, a beautiful photo book that documented the 2017 eclipse. It was the Great American Eclipse, a continent-spanning solar event that would bring squabbling America together, if only briefly. 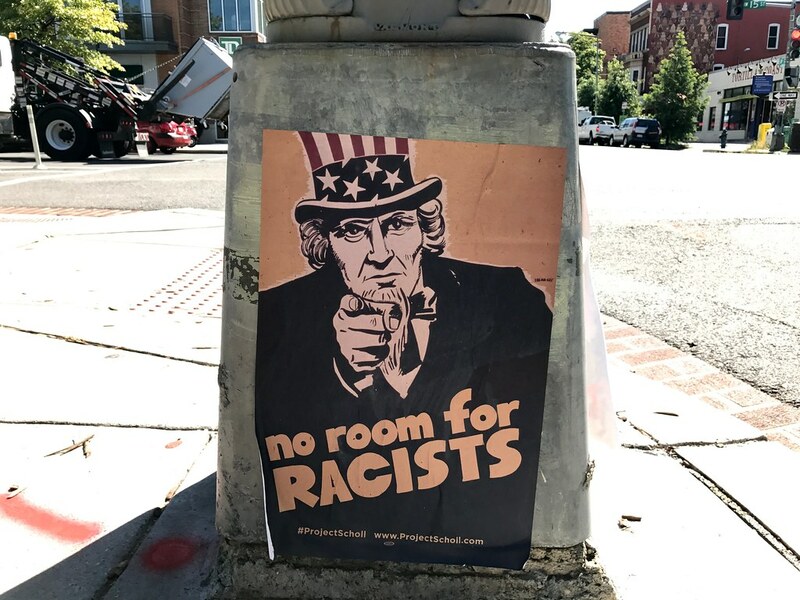 And, who knows, the sight of forces much bigger than ourselves – the sun blocked out by the moon – might even cause people to put aside their prejudices and unite as one. Novels are full of epiphanies, life-changing moments when characters realize the folly of their ways. But real life rarely has those moments for most people never give up their guiding principles, no matter how misguided. With friends near the path of the eclipse, I was determined to experience this unique event. 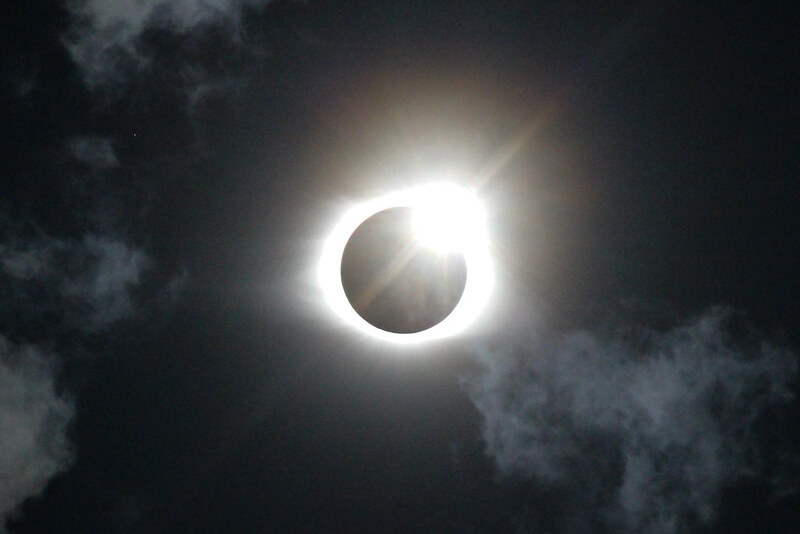 Totality would occur just a few miles from their home in Waynesville, NC. The morning of the eclipse, my friends demurred, seeing traffic backed up on the highway, afraid that they would be caught in a historic traffic jam rather than history. But me, familiar with gridlocked DC, was unfazed, reasoning it couldn’t any worse than the Beltway on any day at any time. It wasn’t. I reached the campus of Western Carolina University with hours to spare. WCU was in the zone of totality and I had my friend’s parking pass so I could park on the closed campus. The biggest problem I encountered was getting something to eat. It was the first day of classes at WCU and students were lined up everywhere for lunch. Slowly, the sun diminished. By the time I finished my sandwich, it was as if the solar orb had been turned down by a dimmer switch, the light fading to the point that I no longer needed sunglasses. Crowds in purple (WCU’s color) filled the center of campus, near the clock tower. 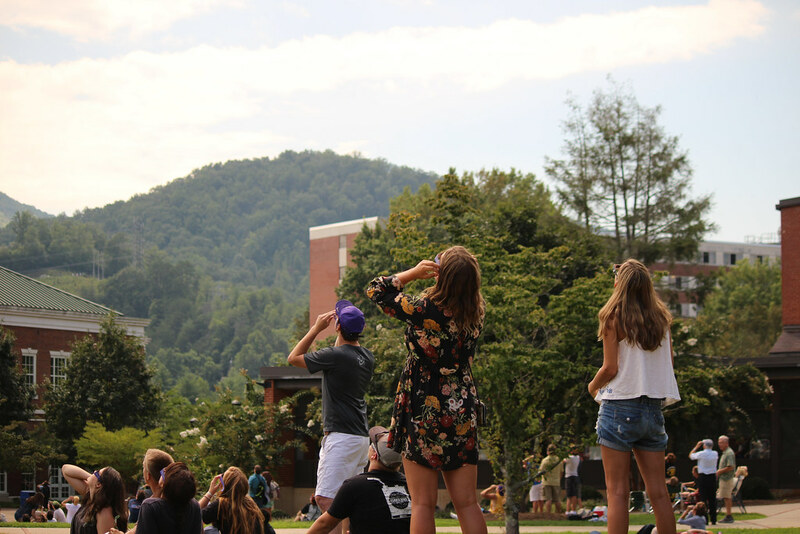 Scientists from WCU provided color commentary while students lined up for eclipse glasses and moonpies. I settled into the grass and waited for the show. Minutes before the eclipse I saw people heading indoors, bags of food in hand, choosing to miss this magical moment. It’s curious but there were some in the path of the eclipse who wouldn’t even look outside, annoyed at the impertinence of the sun. A friend’s mother couldn’t be bothered with it, thinking it all to be overrated. Fake News! But on the packed campus at WCU, the crowd sighed as clouds washed over the golden orb. 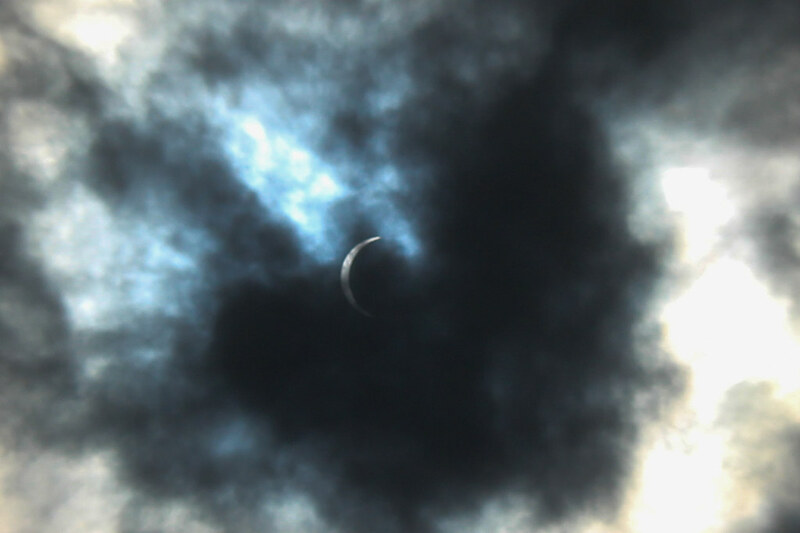 Apps were checked, as students counted down the moment to totality and willed the clouds to part. The moon ate the sun, until just a shining crescent remained, screened by the wispy cumulus. It was beautiful but there was more to come. Seconds before totality, the offending cloud drifted off and the campus broke into relieved applause. Then the sun was extinguished, disappearing, all but the sharp platinum ring of the corona. Students cheered, as if rooting for their favorite team. Eclipse glasses were removed. People stood and embraced, a rising tumult echoing off the mountains. Seated on the grass, lens pointed upwards, I snapped photo after photo in happy disbelief. It was night on campus, the clock tower lit up against the dark sky, stars visible in the blackness but light lingering in the west, like sunset on a strange world. 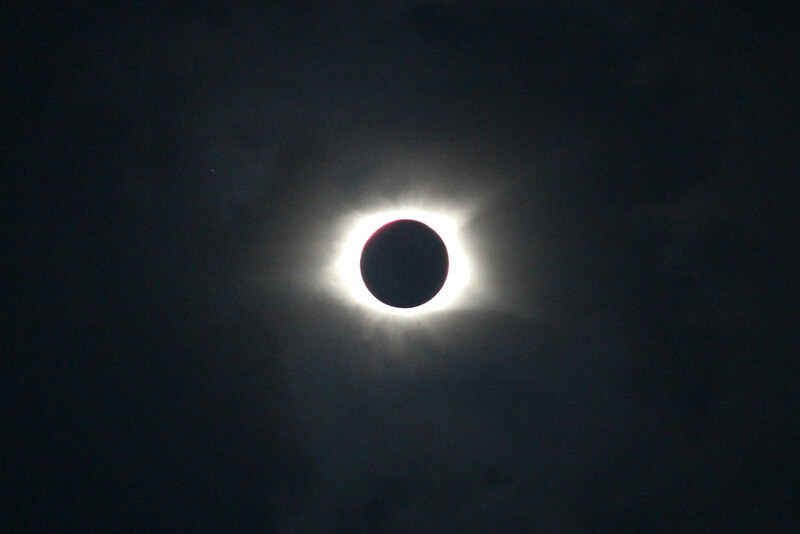 After a minute of star-speckled darkness, the sun broke free from the moon’s grip. Another round of applause then everyone got up to leave, the sky still strangely dim. Traffic going back was bad but moved steadily over Balsam Gap. My friends in Waynesville had seen a lot – like shadow bands and the mountain across the valley go dark – but had not experienced totality. An eclipse is like being pregnant. It’s either 100% or nothing. The next night, Trump gave a speech so unhinged that commentators began seriously wondering about his sanity. The Mad King. The eclipse did not fix America. 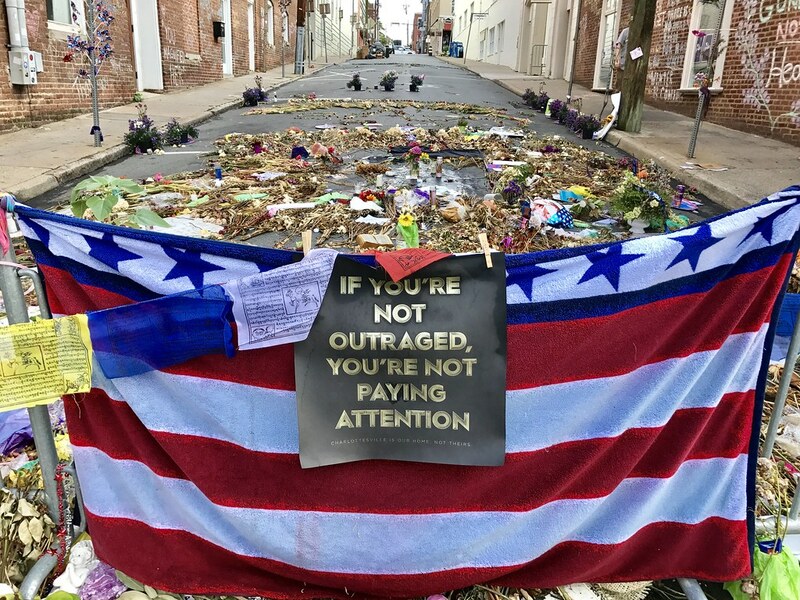 It was not a transcendent moment that brought people together. No one questioned their beliefs following the cosmic occurrence. Despite science predicting the eclipse’s exact path across the United States, there are those who still cry “Fake news!” at any fact that they find disagreeable. The Great American Eclipse will not usher in the Age of Aquarius. Instead, it’s an ominous portent that the ancients would recognize, heralding a time of troubles for the nation. May it just last a moment, exiting quickly and returning light and reason to the country.